NIhilumbra is an iOS port. When I first found that out in my pre-game research, I’ll admit I was nervous. Mobile gaming doesn’t have the best track record in the world, especially puzzle games. This is why Beautifun’s puzzler came as a pleasant surprise. It’s not without its kinks, but overall Nihilumbra is a great experience and a refreshing take on puzzle platformers. 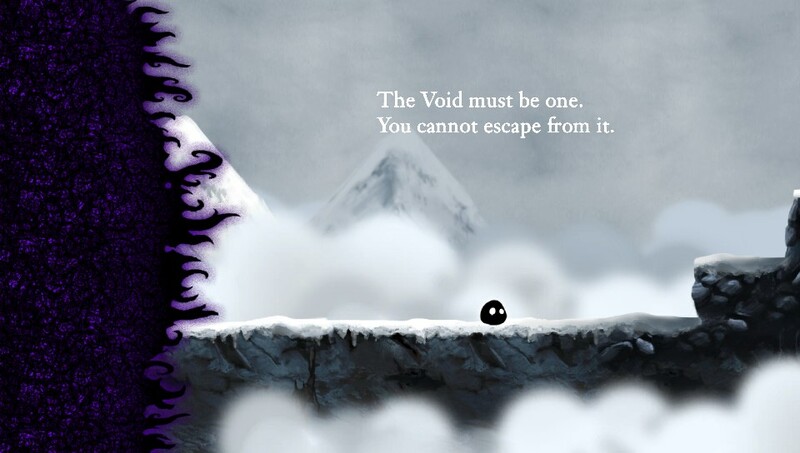 The game starts off in story mode, where you are a blob of black goo coming from the void. A looming narrator tells you why you don’t belong here, and that you will never escape the void that you came from. This is the entirety of the story at the start, and that’s the beauty of it. As you progress you see the mood of the game evolve and the narrator’s point of view slowly start to change. By the end Nihilumbra has a beautiful message to deliver. 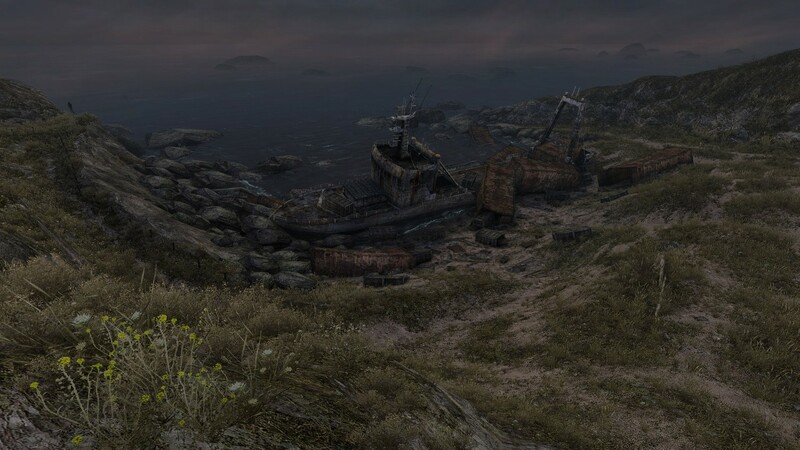 The story was a big factor in why I enjoyed the game, and it really had me motivated to see what would happen at the end. As the blob, you start to earn colors from flowers scattered at the beginning of every level. These colors translate to a different power to help you manipulate the terrain. The puzzles are all based around you using your powers to get to the next area before the void takes over and destroys it. You do this by using the touchscreen to paint colors to change how the character moves. I didn’t find Nihilumbra to be that challenging. Hand-holding takes place for a bit of every level and I never felt like I got to have full control over any of the powers. Despite being easy the game still remained to be pure fun. I loved traversing the levels to see what would come next. Heck, I even beat the game in a single sitting. Nihilumbra finds a decent difficulty and sticks to it throughout the game which I admire, but I wish it provided a greater challenge and gave more control over your powers. On the flip side, once you beat the game you’ll unlock Void Mode. If you felt the game was too easy, then get ready to get destroyed by this game mode. Void mode takes Nihilumbra’s difficulty to the other side of the spectrum, but it’s now far too difficult. After finishing the game, I was happy to see that there was more content to try. But after 15 tries at the first level of the mode, I couldn’t do it anymore. The game quickly passes over from challenging to tedious and makes even trying to beat the first level a struggle. And I’ll be honest here, I only passed 2 levels of Void Mode, but I felt it was enough. I spent hours on it to no avail with lots of anger and frustration. The difficulty spike is apparent, and really cuts the game’s replay value by a lot. The main game only lasts about 3 hours and after you beat it the only things left are trophy collecting and trying out Void Mode. 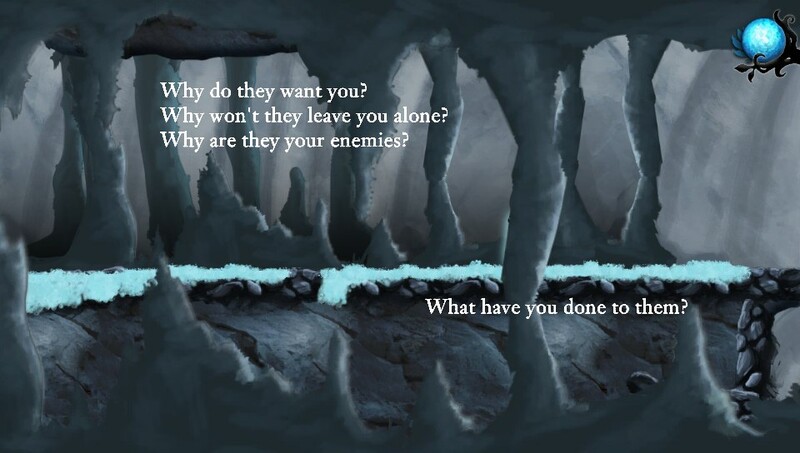 Though if you find it hard as I did, there’s not too much left for you in Nihilumbra. Nihliumbra’s visuals are very run of the mill. They really don’t do anything interesting visually even with the story being based on colors. When using the touchscreen to use your powers everything looks like a washed up mess. It seems like nothing from the visuals was updated from the iOS version, which was a downer. The particle effects is an example that stands out as they filled the entire screen and blocked out what I was trying to do. It’d be nice if some of those visuals were spruced up a bit for the Vita’s OLED screen. The soundtrack and voice-work however, were both great. The music in the game has a very eerie vibe, and fit the story’s mysterious tone. The voice actor also did a great job providing narration throughout the game. He told the story with aplomb, and really guided me through the narrative and enhanced the story. I loved the sound design in the game, and I feel it’s one of its best features. Nihilumbra is a fun game. There’s no denying that for me, but I had some problems with it. The game held my hand a little too much during the main game only to then let go and push me into a volcano for the Void Mode. The visuals were a bit disappointing as well, but the music and voice acting made up for it entirely. The story kept me going and the overall fun of the puzzles made the game an amusing 3 hour treat which is well worth the money. Normal Mode is too easy. Void Mode is too hard.